My pictures do not do justice to the elaborate, three-dimensional silver work under the translucent, dark, cherry red enamel. There are moths hidden among the flowers and leaves, and there is a depth to the design that you must admire in person to appreciate. As the sunlight skips over the delicate, gleaming petals of the most pronounced flowers, the rest of the intricately wrought design falls in varying degrees into the shadows. Rims: Top is bronze & bottom is a light gold colored alloy? Condition: I have gone over this vase with a magnifying glass and bright LED light. 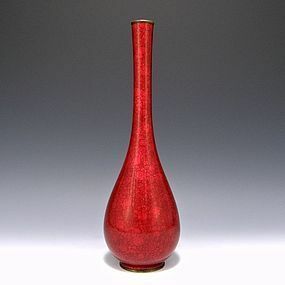 The condition is very good with ONLY a small 1/8 inch scratch on the lower body of the vase that you CAN feel with your fingers (image 7). There are No stress cracks in the enamel and NO repairs.